Based in St Louis, Bremen provides mortgages, loans, and trust services to their clients. hoboken, new jersey nvocc and forwarder with branches in bremen, germany and london, uk. Manufacturer of armored vehicles, personal protection cars, armored stretch limousines, armored busses and vans. Based in Germany. located in fort lauderdale, florida, with a branch office in bremen, germany and agents around the world. air and ocean cargo services. specialists in the overseas transport of vehicles for armed forces personnel. Offering soccer balls, uniforms, and related gear. Specialty teas and gifts. More than 40 shops in Germany. Sells traditional chocolate, candy, cookies, breakfast cereal, baking supplies, snacks, baby food, seafood, cookbooks, and Christmas items. Located in Bremen, Germany. Specializing in total hip and knee replacement surgery. Located in Bremen and Plymouth. Located in Bremen. Provides images of works, pricing, novelty items, and related links. 14 St. Pauli Girl Bremen brewer. Bremen brewer. Includes brewery information and photos, awards, promotions, news and merchandise. Provides information on personnel, meetings, training, and equipment. Photos and contacts included. Provides an overview, personnel roster, apparatus, annual activity, news, memorials, scanner frequencies, and contact details. The history of cycling in America. Photos of many bicycles that are on display at the museum. Located in New Bremen, Ohio. Detailed information on White Wolfs New Bremen Java Chat. Provides resources for different games. Listing of New Bremen related web sites. In character mailing list for Fae in New Bremen. Announcement only list for shifter players in New Bremen. Mailing list for updates for Werewolf characters in New Bremen. Resource for Changelings in New Bremen. Features a test, faq and game information. Information on the players, rules, resources. Also features a list of instructors. Mailing list for requests for general experience and equipment updates for New Bremen characters. Provides a guide to character creation, locations, experience, storytellers, together with player characters of note. Discussion and announcement list for Mage players on White Wolfs New Bremen chats. Mailing list for players of Ahroun characters in New Bremen. Werewolf Pack on White Wolfs New Bremen. Features pack information, allies, enemies, prophecys and resources. Detailed information for Wraith players. FAQ, biographies, and information on people, places, plots, and forms. mit informationen zu den konzert-terminen, der diskografie und den musikern. includes concert calendar, photographic archives, partial discography. The portfolio site of the contemporary German photographer. The Lifeboat Bremen, pinhole, and concept. Projects include Zetman, Bremen, Say Hello To Black Jack, Rokudenashi Blues and others. HTTP and BitTorrent downloads. SiteBook Bremen City Portrait of Bremen in Georgia. 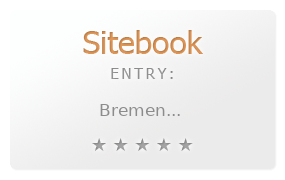 This Topic site Bremen got a rating of 4 SiteBook.org Points according to the views of this profile site.